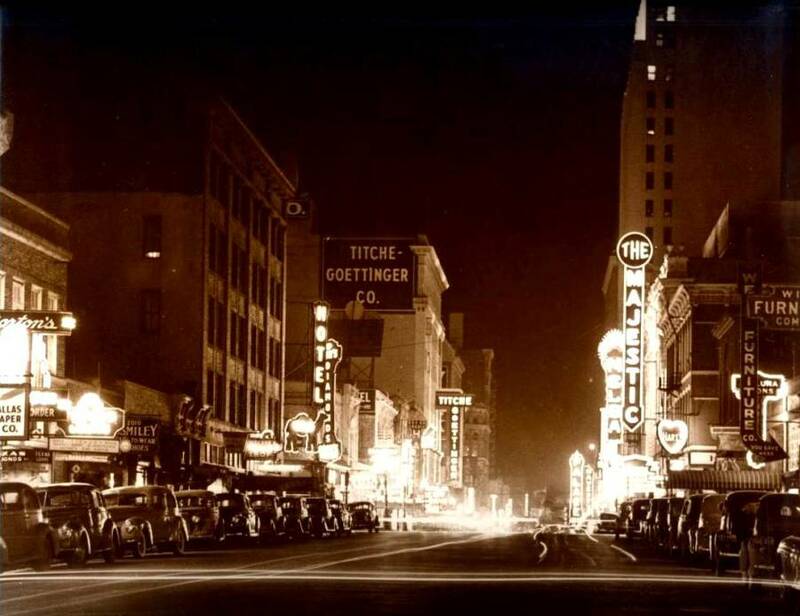 Elm Street - Early 1940s - The "Dallas Theater District"
This picture is looking west on Elm Street. In the foreground on the right (north) side of Elm, we can see the Hart Furniture sign (1933 Elm St). The Hart Funiture building still stands and is one of the few pre-1900s downtown buildings that still exists in Dallas. Down the street from the Hart Furniture building we see the Majestic, Melba, and Palace theater signs. Not clearly visible is the Tower theater sign, which would be between the Melba and Palace. West of the Palace, would be the Rialto, Capitol, Telenews, and Queen theaters. Clearly, 1940's Elm Steet in downtown Dallas was a happ'ning place..... and the current generation "thinks" lower Greenville Ave is cool!